According to Jane Sibbett, who played Ross’ ex Carol. Friends is straight culture, that’s not something we’re arguing, but it did feature a few queer characters — however problematically they were portrayed. Remember Kathleen Turner as Chandler’s trans dad? Or the time Ross assumed Rachel’s male nanny was gay? Or the time Ross preempted Kevin Hart by yelling at his son for playing with a Barbie doll? Yikes, Friends would have been cancelled if it had aired those episodes today. One of Friends less offensive queer characters was Carol (Jane Sibbett), Ross’s ex-wife who left him after realizing she was gay. 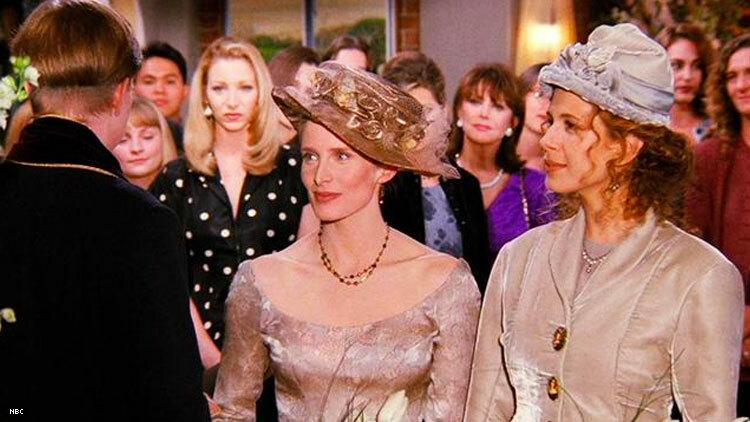 In the season two episode “The One with the Lesbian Wedding,” Carol married her partner Susan (Jessica Hecht). But according to The Guardian’s new article “'Jennifer Aniston cried in my lap': the inside story of Friends,” that landmark lesbian wedding wasn’t shown everywhere in the US.